What is the institutional TOEFL test? 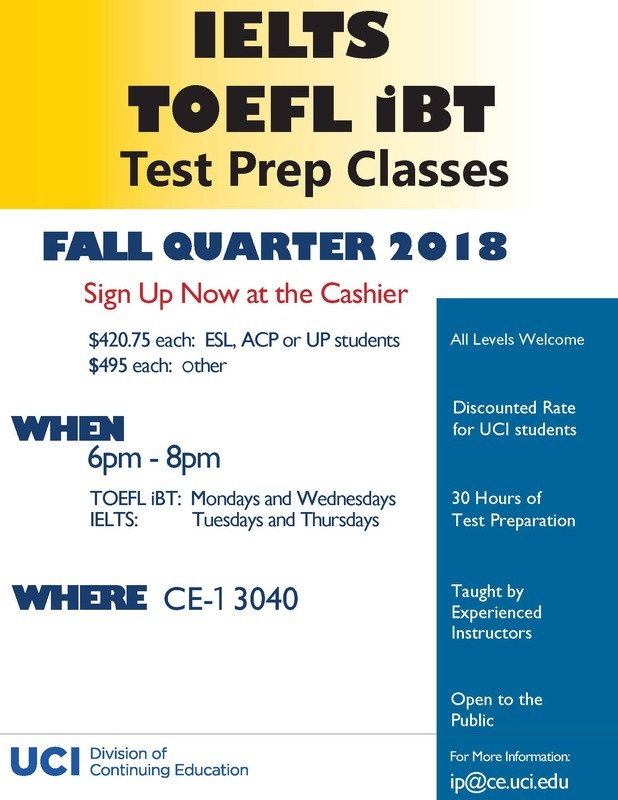 UC Irvine Division of Continuing Education (DCE) offers the Institutional Test of English as a Foreign Language (TOEFL) during each month. This is a paper-and-pencil test, with listening, grammar, and reading sections only. There is no speaking or writing section. DCE's Accelerated Certificate Programs (ACPs) accept scores from the iTP TOEFL for admission purposes. This test is NOT the iBT TOEFL and cannot be used for admission to colleges and universities. If you want to take the test, you may register in person at the CE-3 Cashiers Office. When will my score be ready? TOEFL scores will be ready 2-3 weeks after the test date. You may pick up your score report in CE-3, or we will mail it to you upon your request. When the scores are ready to be picked up, we will post flyers outside of your classrooms. I lost my TOEFL score. How do I get another one? We cannot make copies or duplicates of your lost TOEFL score. However, you can request a letter at CE-3 that lists your score. If you'd like a copy of the Registration Booklet with information about the test and sample questions to help you prepare for the test, ask for one in CE-3. You can also download one from the ETS website: http://www.ets.org/toefl/pbt/about/bulletin/. For those students interested in taking the TOEFL iBT or IELTS tests, we also offer test preparation courses.